Going higher? Wonderfully, as we kick off a new year, I can confidently say that the list of artists in Reggae making great music is quite lengthy. Besides those who started out streaks of quality prior to the year and maintained, such as Perfect Giddimani and Busy Signal, we've also had to add the likes of Anthony Que and others who really, in one way or another, began big things in 2012. The year, as it was for so many others, was also a strong one for Reggae from out of the Virgin Islands and, once again, piecing together and delivering a massive musical experience was Vaughn Benjamin and the immortal Midnite. Looking back, it was somewhat of a slow year for Midnite with 'only' a pair of albums to their credit, but to my opinion, those two albums, "In Awe" and "Children Of Jah", were a pair of the finest you'd find from anyone in what was such an impressive year for Reggae music album releases. This not only happened in a year which would include individual sets from Ras Batch, Bambú Station and Ras Attitude, some of the biggest names on the VI scene, but it also occurred in a year which followed 2011 which would produce, arguably, one of Midnite's most popular ever, the towering "Kings Bell". So, it was definitely important, for the time, that the subgenres biggest of names do big work and that is exactly what we got. Because of that, as oddly as it may seem to say because of Benja… Midnite's overwhelming prolificacy, I'm also confident in saying that the 'streak' we're now in, FOR ME at least (and Midnite has FAR greater fans than me) (not an expert), is one of the most remarkable of their now forty-six album wide vault. In my opinion, the last four Midnite albums were at least VERY GOOD. The one album which reached just prior to "Kings Bell", "Anthology", was an actual Midnite album and, in retrospect, was outstanding. Also in the not too distant past is an album which has become a personal favourite of mine in "What Makes A King?". Therefore, again, as someone who isn't instantly in love with every release carrying the name 'Midnite', I think that is something quite special. So! After all of that work (and the other forty albums), what do you do for an encore? You keep it going. Surely you didn't expect anything different. 2013 is a couple of weeks old and there is already a new Midnite album, with another ["Children Of Jah In Dub"], presumably still in the works and forthcoming. On top of that, I (and YOU) would be completely shocked if the year did not also bring us at least a couple of entries from the Midnite-heavy Rastar Records (one of them will likely be the Dub album) and who knows what else. Like I said, a two album year from Midnite is kind of "slow", but 'they' definitely made the most of it and continue to. 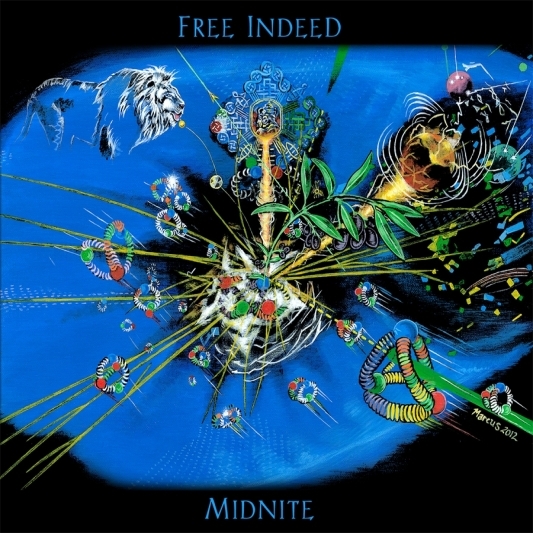 With Rastar still certainly brewing on their next move, the latest Midnite album, "Free Indeed", comes from yet another popular stop along the journey, Higher Bound Productions, who has produced the latest in a downright mesmerizing streak from Vaughn Benjamin and company. 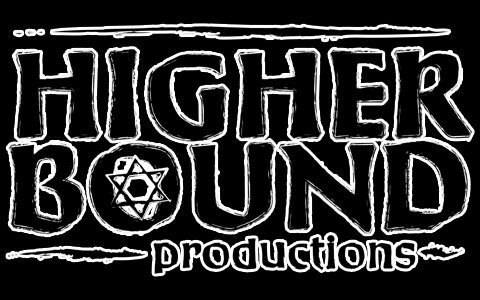 Previously, by my most certainly incorrect count, Higher Bound has had their hands in a couple of Midnite releases, "Bless Go Roun" (and its great cover) (this new one is excellent as well) from 2007 and "Ark A Law", three years on. Although I do remain fond of the former to a degree, neither of the two are favourites of mine, even now, and I wasn't having great difficulty waiting for #3 in the Midnite/HBP union. I will, however, be anxiously awaiting #4 now. They also did a pretty nicely received compilation back in 2008, "New Name", which featured several tracks featuring Midnite, Ancient King, Jah Rubal and others. The California based label has chosen to make Midnite part of what is apparently set to be a big year for them as this album is released virtually simultaneously with "Ethiopie", a full set from fiery St. Croix veteran chanter, Ancient King. Still forthcoming is "Songs Fa Jah” from another veteran from out of the VI, Abja. It probably goes without saying (and I'm saying it right now… anyway) that "Free Indeed" has, figuratively at least, become the centerpiece and main-attraction of that trio of albums and after hearing it --it is possible-- but Abja may have to do something damn special to unseat it as the LITERAL focus point of them also. "Free Indeed" is EXCELLENT [!] and I didn't get very deep into it at all before that thought popped into my head and, as you can see, it never left after its arrival. It actually brought me to the point where, along with enjoying the previous albums so much, I thought about going back and listening to every single Midnite album that I didn’t like and seeing if I was just missing something at the time and I did in the case of "Ark A Law", but that wasn't it. This album is just strong, regardless of what you compare it to and I am going to compare it to something later. While this project is still in the early stages as far as a release, I've seen quite a bit of interest in it already, which isn't rare for a Midnite album but, following the "Kings Bell" record which was everywhere, I find myself paying more and more attention to how their albums are promoted and Higher Bound has a bit more of an interest in doing promotions now (because they have three albums), but so far I think that we can say they're doing an excellent job on the business side of things. How about the musical side? As I said, they're not struggling there either. Here, they have a winner. How big of a winner exactly? Let me tell you about it. The first thing that I noticed about this album was just how 'bright' it was at times. If you've listened to more than a couple of Midnite albums (and you have ), you know that the sound can go in a variety of different directions, just like the songs over it and this time around, HBP has taken a more dynamic course in my opinion, even with some of the heavier moments present. Because of that, I would definitely liken this release more towards the "Bless Go Roun" album rather than "Ark A Law". The new album, "Free Indeed", however, is significantly better than either. One of its finest efforts gets us going in the form of the sterling 'Is His'. This tune is almost a completely minimal and skeletal sound and, while sometimes I don't find myself enjoying those type of songs, 'Is His' is much different. It's also a piece demonstrative of the quintessential Vaughn Benjamin stirring sound as he marches straight ahead, lyrically, to give praises. Next, things get even sweeter with 'Don't Be So'. There're so many things to like here and, ultimately, it is this great melding of a one of a kind message with a track which absolutely grips itself into your attentions. 'For His Speech' is next and this is a song which was really FUN for me. You'll listen to it and probably think of a different (and very likely more fitting) descriptor, but I heard this song and I knew that digging into it would be a great time for me, a nerd, and it was. It is one of my favourite songs on the album and… I probably haven't even remotely come close to finishing what I'll ultimately end up receiving from it . Checking in at a very healthy, but not at all burdensome, fourteen tracks , "Free Indeed" not only offers many good songs, but it does so in a different variety of sounds. Still, as I said, they all, even some of the more 'sizable' styles, have a really communicable and appreciable prevailing sound in my opinion. A good example of this would be a song such as the ROLLING 'Outcome'. You'll hear this tune and, like I did, have an immediate response to the riddim, but if you listen to the entire song, you, also like I did, are almost sure to enjoy it, as comes through in this style which is not only very unique, but escalating as well. Very passionate song. Immediately following that piece is the far more serene, but still excellent 'Perceptual Vortex'. Here is another song which kept me busy for awhile and still is because the journey to comprehension in its case is so captivating. Regardless it's within each one and every one of a perceptual vortex of riches"
BOOM! 'Green Pastures' is another one with a very unusual sound that doesn't approach sacrificing quality for originality. I guess I would refer to this style of track as 'spiraling' but, as happens when you listen to Vaughn Benjamin, it's almost as if it is not there. He pays not the slightest of attention to it and, instead, goes through this almost overly impressive lyrical tirade. And it's not one way either: Almost as if they're running parallel to one another and not actually with each other, well after Benjamin's vocals have ended, the riddim continues along its own ways. 'High Order' of a fuller and more vibrant fashion, and that is a style which, so nicely, links up with what is being said on the tune. Not being the most emotive of artists every time out, that's a trait which isn't common to Benjamin's music but, here, he also shows it is one which he, unsurprisingly, has mastered as well. Check both 'Battle' and 'Mock Off' which're very strong and the type of songs that might get lost here. Allowing that to happen for you, particularly in the case of the latter, is 'high order' madness. 'Mock Off' is genius. I don't think that a similar fate is in line for the final song on "Free Indeed', 'Healah', which forces itself into a standout. To my ears, this tune has just a bit more of an edge to it, which really adds another dimension to what we hear. Vaughn Benjamin seems to be just a little pissed off on this tune and it does match what he is saying for the most part. The remaining selections on the new Midnite album from Higher Bound Productions, “Free Indeed", for me at least, comprise the prevailing class of this album. This quartet of songs just really did some powerful for me and I say this on an album full of such creations, so you know that a difference in these instances had to be even more forceful. One of these best of the best tunes was easily the crystal clear title track ["ONLY CERTAIN MAN FROM LONGTIME WAS NOT FORCED TO KNEEL"] [BOOM!] which is fantastic. Ostensibly, there isn't anything here, in terms of the vibes, but Benjamin shines very brightly here with words and the track may not be special, but it works so well for this tune. Also doing good work is the earlier tune, 'Envision', which is another lacking this great style, but that's all it was lacking. This is the type of song where I'm wondering if anyone else will react to it greatly because for me it is outstanding. Every song on the album to my ears, however, are fighting for second place behind the MASSIVE and unforgiving 'Hemp Scroll', which is definitely one of the best songs I've heard lately and may very well be on its way to becoming one of my favourite Midnite songs of all time. IF DEM KNOW DI CURE, DEM WOULD BEAT DOWN GANJA DOOR!" Study proper usage inna di ites weh you hold"
This tune just gives you no relief and you do not deserve it! From the first word spoken it is a serious stream of lyrics coming through and absolutely brilliant and golden. It also has an infectious vibes to it and you'll find yourself with your head down and moving and just thoroughly enjoying this EXPERIENCE of a song. Lastly, check the moving 'To Gain To Lose' and its gorgeous tones. I think this song will be regarded as one of the signature moments from the album by many fans and I'm already one of them. Overall, I cannot really find anything lacking here. I finished listening to the album and then finished examining it for the sake of review in a kind of a… 'hesitatingly convinced' mood. I think in the back of my mind that I keep 'secretly' (well, not anymore) expecting to run into that next Midnite album and walk away from it thinking 'okay here's the next odd album', but here we are now with five albums consecutively and that hasn't happened (and, again presumably, should that next album be the Dub release, that streak will almost surely be six). Going further, can I say that for anyone else [?] - that I've actually really liked their last FIVE albums? The two names coming to my mind are Bunji Garlin and Beres Hammond but, if that is accurate, in their respective cases, we're talking about around a decade worth of work and probably more. Here, we're looking at a couple of years' time. That's amazing and this album, to my opinion, is every bit as strong as "Children Of Jah" from last year and… maybe even "In Awe", which is an album I still LOVE. Count "Free Indeed" as the latest album in an ultra beautiful streak from Vaughn Benjamin and Midnite which is now forcing me to not only count them as amongst those consistently making some of the finest music in the entire genre, but also consider the notion that, after all of these years and after all of these albums, at least as far my tastes go: Maybe Midnite is getting better? Exceptional.